Light-reflecting stems hover like a cluster of stars. It's what happens when up to 18 wine glasses hang from this solid mahogany rack suspended by nickel chains. Adds visual delight to a room while saving cabinet space. Showcase stems, save on space. Light-reflecting stems hover like a cluster of stars. It's what happens when up to 18 wine glasses hang from this solid mahogany rack suspended by nickel chains. Adds visual delight to a room while saving cabinet space. Fold-able design for easy storage when not needed. Does not include mounting hardware. BEST ANSWER: Thank you for your question. You can adjust the chains. Please call us with any other questions at 1-800-356-8466. The chains are "adjustable" but will require the use of pliers, a Phillips screwdriver and/or bolt cutters. Yes the length of the chains on the Hanging Mahogany Wine Glass Rack are adjustable. What type of hooks does this require? BEST ANSWER: Thank you for your inquiry. Any standard hook would be fine. I would choose one that has the best finish or look for your decor. Any further questions, feel free to contact a Storage Consultant at 800 377 3330. Thank you again. Can you ship to the United Kingdom and if so what would be the shipping cost? BEST ANSWER: Since I do not live in the UK, I wouldn't have the foggiest idea of shipping costs. I do like my wine racks, though (I have four of them). You can use International check to get rate online. how do you hang this rack? what is the weight of the rack without the glassware? BEST ANSWER: The hanging Mahogany Wine Glass Rack weighs 4lbs and you secure the rack to the ceiling with toggle bolts and ceiling hooks. Same question, how much does this weigh ? BEST ANSWER: Although I did not weigh it before I hung it I would estimate it to be about 2lbs or slightly less without the glasses. I'm very pleased with this item.. So I can check if my glass will fit together in this holder, can you please advise what the distance between two holes is - mid hole to mid hole. will my reidel wine glasses fit in this product? BEST ANSWER: Yes, most Riedel glassware will fit in this rack. Thanks for your question! We bought this for the size as we had limited space for a rack. Larger wine glasses-(ie: Bordeaux and Pinot Nior)crowd other glasses (Martini glasses are definitely out). It takes some strategy to place the glasses on the rack so they won't knock together and break the fragile ones. We have been able to be satisfied with placing 6 larger red wine glasses with 8 white wine glasses and filing in with 4 cordials or flutes. The rack will not hold thick stemmed glasses. The only issue I have with this is that two of the slots for glassess in the front and in teh back are very close to the chain that the rack is suspended from, so you can only hang wine glassess with small bases from those slots in order for them to fit. I bought two of these, and hung them side by side over my sideboard. 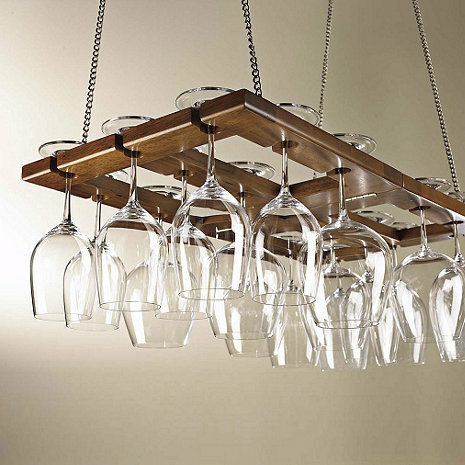 I love the look of the wine glass rack, but only half of my wine glasses will fit in it. The opening that the stem slides through is too narrow, so this rack only solved half of my storage problems. And I also had to put a wedge in the center where it unfolds, to make it level, otherwise it hung lower in the middle than the sides. I do get tons of compliments though, and I love it, I just wish the openings where just a tad wider. I've though about taking a file or something to make them bigger myself. But that requires time, and that's something I don't have a lot of. I do love the rack though! The rack wouldn't hold our Shannon leaded "Dublin" crystal glasses. 1 hour of labor fixed everything wrong with it. I used a jig saw to widen the openings from 1/4" to 1/2". Routed the holes so the glasses fit flush. Cut the chains to make 4 mounting points instead of 2 so it won't rock like a swing. Stained the modifications to match. All in all I could have built a better rack from scratch for $15, however, as a starter template this thing is great and cut hours off a "from scratch" project. We bought this knowing that the chain was not long enough for our high ceilings. We loved the look and was sure it would be beautiful in our kitchen, hanging over the island. We bought a longer chain to replace the one it came with and it has meet all of our expectations. Awesome! Just as advertised. Looks great in our rec room over the wet bar. Will not hold glasses with thick stems i.e. brandy snifters but everything else fits. Very easy to install but have to get your own hooks. Delivery was fast and in great shape. My second order arrived in less than a week. Half of my stemware won't fit into the "very small" openings. This wine glass holder allows me to hang all 5 various sets of glasses that I own without worrying about any falling out. I can hang many styles and the size of the bottom of the glasses don't matter. It was exactly what I was looking for and came at a good price. We installed this rack above a bar. Now our wine glasses are easily accessible. We installed this over a bar, it is a great use of our limited space. My daughter bought this for me a few years ago for my birthday and I love it. She obviously loved it too as she recently got married and wanted one like mine so this is for her Christmas. Apparently a lot of people like this as it's on back order and I haven't received it yet. Love the extra room in my cabinet! Just as described - Happy! We use the product to securely hold stemware and clear space on our serving cart. The only con is that the chain that came with it was way tooo short!!! Great product with the exception of the chain. I replaced the chain with a better quality item. the rack looks just like the diplayed picture. The only thing that i was not happy with is thay it "sags '' in the middle. [...] Item was what I expected based on the pictures and description provided. I did have to run out and get hooks from [...] because hooks were not included. I guess the pro to hooks not being included is that I got to pick out the exact look I wanted but I didn't like having to stop and go get hooks in the middle of me trying to hang it up. Using it in a garage converted into to a bar area. Perfect fit.